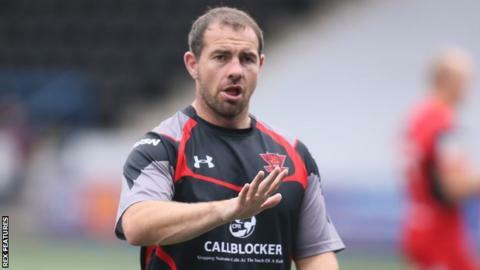 Salford Red Devils head coach Ian Watson has signed a new three-year contract with the Super League club. Forwards Ben Murdoch-Masila and Weller Hauraki, prop Lama Tasi and centre Junior Sa'u have also agreed new deals. Watson took over after Iestyn Harris' departure in July 2015 and guided them to safety in his first season. Sunday's 13-12 win over Castleford, in which Murdoch-Masila scored two tries, left the Red Devils fifth in Super League after six matches. "This a really proud moment for me," Watson, 40, said. "I'm delighted to be given the opportunity to be able to continue to take it forward." "I feel like we have come a long way since 2015, and with the foundations we have put in place over the last two years, we will be able to establish this club at the top end of Super League." Salford beat Hull KR in the Million Pound Game to secure their Super League status in October and Red Devils chief executive Ian Blease believes Watson's new contract will help the club push on. "Getting Ian signed on a long-term deal is a key part to what we are trying to achieve as a club," he said. "I know first hand just how ambitious he is and it is a hugely exciting time for the Red Devils."